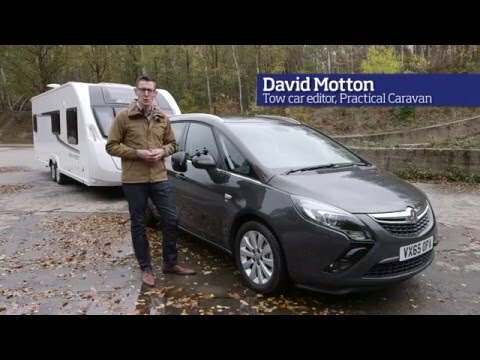 Don't underestimate the Vauxhall Zafira Tourer – watch our expert's tow car test to find out more! While the Vauxhall Zafira Tourer has been around for a while, the 170PS (168bhp) diesel is a recent addition to the engine line-up. On paper, it combines the pulling power needed to tow a family caravan with very good fuel economy and low emissions. We’re testing the seven-seat MPV in SE spec, which has a healthy list of standard equipment included in the £25,675 price. We’re hoping the Zafira Tourer will tow well and as a seven-seat people carrier it should also be very practical, with a flexible cabin able to cope with lots of people, loads of luggage, or a combination of the two. Read on to find out what tow car ability the Vauxhall Zafira Tourer has. You’ll have a hard time finding the Zafira’s kerbweight when doing your buying research, because it’s not published on Vauxhall’s website or in the brochures. When the kerbweight is so important in making decisions as to what a car can and can’t reasonably tow, we don’t think that’s good enough. In fact, the Zafira Tourer 2.0 CDTi 170 SE weighs 1760kg. That gives an 85% match figure of 1496kg, well within the legal towing limit of 1650kg. We matched the Zafira Tourer to a Swift Expression 626 with a Mass in Running Order of 1413kg. Despite having a twin-axle caravan to pull, Vauxhall’s diesel engine impressed from the off, comfortably holding 40mph up a steep hill in fourth gear. The power output of 168bhp is healthy enough, but it’s torque that does the hard work when towing, and the engine puts out 295lb ft from 1750rpm to 2500rpm. You’ll have to pay nearly £3000 more for similar poke in a Ford S-Max. Accelerating from 30-60mph, as you might when joining the motorway, took 13.3 seconds. That’s a good, determined pace. If anything, the engine’s refinement is more impressive than its strength. Vauxhall is justifiably proud of how quiet it is. It’s a lot quieter than the diesel engine fitted to the recently-tested Jaguar XE, for example. Stability-wise, the Vauxhall also makes the grade; there’s some bobbing from the front of the car on bumpy roads, but very little side-to-side movement. Only in very strong crosswinds did the driver really have any work to do, and even then slight steering-wheel movements were all that was needed to keep car and caravan heading in the right direction. In calmer weather the Vauxhall is a relaxing tow car, confidently keeping the caravan under control. The Zafira also performed solidly in the lane-change test. On the fastest runs we could feel some pushing and shoving from the caravan, but we never felt that the tourer was about to take charge. And if you have space to stop rather than swerve, the Zafira Tourer’s brakes are up to the job. A stopping distance of 10.6 metres is very respectable. The only area in which the Vauxhall disappointed slightly as a tow car was the hill start. The electronic parking brake (standard on SE-spec cars) did a predictably fuss-free job of holding car and caravan still on a 1-in-10 slope, although it took a little more clutch slip than we expected to pull to the top. When we tackled the same slope in reverse, there was a hot smell from the clutch and some vibration through the pedal. Reversing uphill with a caravan is a pretty rare occurrence, though. The fundamental qualities of a good tow car are all on show, with impressive stability and a very strong and quiet engine. The Vauxhall Zafira Tourer’s strongest point as a solo drive is the engine’s refinement. It really is very hushed and, without a caravan to pull, the strong mid-range torque is even more evident. Even with a full load of passengers and luggage it should overtake decisively. If you favour ride comfort over a sharp and agile drive, you’ll like the approach Vauxhall has taken with the Zafira Tourer’s suspension. It deals with sharp bumps very well, but there’s a loose feel on country roads which doesn’t encourage brisk driving. The steering is also rather numb and unresponsive either side of straight ahead. No one expects a big MPV to handle like a hot hatch, but those after a more dynamic experience will prefer the S-Max. The Zafira Tourer is an easy-going thing around town, where the relatively soft suspension stops speed bumps and potholes from disturbing passengers too much. The thin front pillars give a good view out, which helps you to guide the Vauxhall safely through busy urban streets. Look over your shoulder when parking and the view isn’t quite so clear, but front and rear parking sensors are fitted as standard. A rear-view camera costs £200 and is money well spent. Head out on the motorway and, although there’s some wind noise, the cabin is quiet enough for relaxed long journeys. This is what it’s all about if you’re shopping for an MPV and, while it may not have as many clever touches as a Citroën Grand C4 Picasso, the Zafira Tourer’s cabin is roomy and versatile. The driver and front-seat passenger have lots of room to stretch out. Legroom is very generous, and even with the seat raised to its highest setting, a driver would have to be very tall to get anywhere near the roof. Storage hasn’t been forgotten, with the sliding ‘FlexRail’ system making the most of the space between the front seats. There’s additional space beneath the front passenger seat. The second row offers enough leg- and headroom for adults to get comfortable, although there’s no storage under passengers’ feet as you would find in the Grand C4 Picasso. Air vents in the door pillars should keep everyone cool on warm days (and vice versa), although the relatively narrow cabin makes sitting three abreast a relatively tight fit. The third row is predictably a lot more cramped, certainly with the middle row set all the way back. That second row can slide forwards to make travelling in seats six and seven a little more comfortable. Even then, though, the third row is better suited to children than adults; the Grand C4 Picasso offers more space in the back. Luggage room is very tight with all seven seats upright. Fold the third row into the floor (it’s a quick and easy job) and space increases to an estate car-beating 710 litres. Fold the middle row as well and that rises to 1860 litres. With a price-tag of £25,675, we think the Vauxhall Zafira Tourer 2.0 CDTi 170 SE looks good value when the nearest equivalent Ford S-Max costs £28,445. If you haggle, the asking price for the Vauxhall will drop further: What Car?’s research suggests a typical transaction price of £24,110. Your money buys a reasonably generous level of kit. Climate control, rain-sensitive wipers, the FlexRail storage system, storage under the front passenger seat, an electric parking brake, 17-inch alloy wheels, Bluetooth connectivity, a digital radio and cruise control are included in the price. You also get the OnStar system, which provides onboard Wi-Fi, automatically calls the emergency services after an accident and links the car to a compatible smartphone. Safety-wise, the car comes with a stability control system and six airbags. A trailer stability programme is part of the £700 towing pack, along with a detachable towbar. When Euro NCAP crash tested, the Zafira Tourer scored five stars out of five for overall safety. Running costs should be low; the official combined economy figure is 57.7mpg and we achieved 28.6mpg towing on a mixed route of A-roads and motorways. That’s impressive, given the tourer we were towing. Vauxhalls don’t tend to hold their value as well as some rivals. What Car? predicts the Zafira Tourer will be worth 39% of the original asking price after three years and 36,000 miles. That’s not great, but it’s no disaster. It’s easy to underestimate the Vauxhall Zafira Tourer. It’s been around for several years now and the anonymous looks don’t do it any favours. But beneath the bland, generic styling there’s a very well-sorted seven-seat MPV. The seats fold, slide and perform all the standard tricks, and there’s plenty of space in the first and second row. The third row is more cramped, but slide the middle row forward a bit and it’s usable enough. There’s no underfloor storage and no second interior mirror for keeping an eye on children, but the FlexRail sliding storage between the front seats shows that Vauxhall has thought about the demands of families. From the driver’s seat, the highlight is the new 170PS engine. It’s very refined and quiet, but has enough muscle to pull any sensibly matched caravan. It posts some impressive economy figures, too, both in the official tests and on our own economy route. The Zafira Tourer is a comfortable car to travel in, smoothing over bumps in regular driving and while towing. That said, tauter suspension would make the Vauxhall more fun to drive on B-roads. Despite the soft suspension, we had no sweaty-palmed moments towing with the Zafira Tourer, and the car performed solidly in the lane-change test. With a sensible price-tag and reasonable discounts, the Vauxhall is good value compared with rivals. To underestimate it would be a mistake.